New research finds that just the sense that we’re working together with others can dramatically increase our motivation to complete difficult tasks—even when we’re actually working alone. Across five experiments Stanford psychological scientists Priyanka B. Carr and Gregory M. Walton concluded that even subtle suggestions of being part of a team dramatically increased people’s motivation and enjoyment in relation to difficult tasks, leading to greater perseverance and engagement and even higher levels of performance. “Simply feeling like you’re part of a team of people working on a task makes people more motivated as they take on challenges,” says Walton. Carr and Walton hypothesized that a sense of working together would fuel intrinsic motivation by turning a tedious task from work into play. For each of the five studies, participants first met each other in small groups of 3-5 people before heading to separate rooms—ostensibly as part of a study on solving puzzles. Once alone, each participant was told they could take as much or as little time as they liked in solving a difficult (actually unsolvable) puzzle. Half the puzzle-solvers were given subtle cues that suggested they were working on the puzzle as part of a group along with the other participants. They were told that the study investigated “how people work on puzzles together” and that after working on the puzzle for several minutes, they would receive a written tip from one of the participants they’d just met. Meanwhile, other participants completed the same task, but without receiving any of the “working together” cues. They were simply told that they’d be solving a puzzle and that after a few minutes they’d receive a tip from the experimenter. A few minutes into the task, each participant received the same handwritten note with a simple tip for working on the puzzle. After 25 minutes the participants were told they could stop working, and were asked to fill out a short survey. Even though everyone worked on the puzzle alone the whole time, those who felt like they were working on it “together” with peers worked on the puzzle 48% longer than those who thought they were working alone. Those in the working-together condition also rated the puzzle as more interesting than those in the working-separately condition, indicating that this boost in productivity reflects an increase in intrinsic motivation—finding the puzzle inherently rewarding and fun—rather than a sense of competition or social obligation. It’s important to note, however, that the research does not suggest that group work is always better or necessary as a means to motivate people. 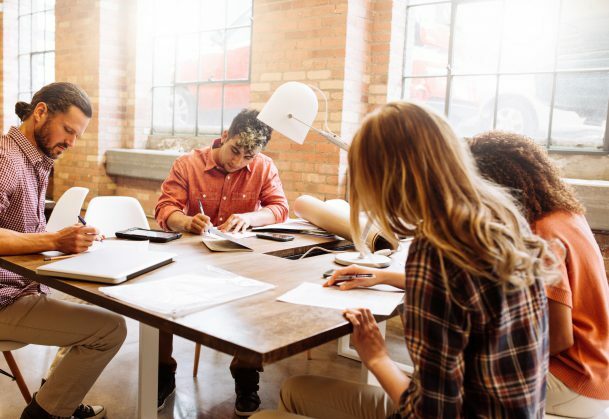 Group work can have negative effects on productivity if people feel obligated to work with others, if they feel their contributions go unnoticed, or if they don’t have ownership over their work. The findings could have positive implications for enhancing motivation in school and work settings in which people don’t always experience working together as a team. For example, utilizing social cues that suggest teamwork in the office may help increase workers’ enjoyment of their solitary projects.